Officials in Puerto Rico praised President Donald Trump on Wednesday for temporarily waiving the 1920 Jones Act, which they said would help provide faster relief as the island tries to recover from Hurricane Maria. But what exactly does that waiver do — and will it actually help? Here’s a look at the nearly-century-old law and how it could affect recovery on the U.S. territory. What is the Jones Act and why was it created? The Merchant Marine act of 1920 was designed to create a safe network of merchant mariners within the U.S. after World War I, in reaction to the U.S. fleet being destroyed by the German navy. The Jones Act requires all goods shipped between U.S. ports to be transported by U.S. vessels (and operated primarily by Americans). It calls for providing the nation with a merchant marine that can transport goods between U.S. ports, increase national security during war times, and support a U.S. maritime industry. This nearly century-old law has been amended several times, most recently in 2006. While much of the current attention on the Jones Act is focused on foreign shipping regulations, the law also contains important information about the maritime industry’s responsibilities regarding safety and well-being of crew. It safeguards the rights of sailors from being exploited, requiring compensation for injuries due to negligence by their employers. It requires employers to maintain safe environments and provide medical care, and also sets standards for vessel maintenance, safety equipment such as lifeboats, and crew qualifications, training and licensing. And, this all-encompassing law has something to say about the environment too, requiring all U.S. ships to comply with EPA regulations. How does the Jones Act restrict vessels entering Puerto Rico? Under the Jones Act, any vessel can enter Puerto Rico. In fact, many foreign vessels enter Puerto Rico regularly, importing goods from countries around the world. However, transportation of goods between two U.S. ports must be carried out by a vessel that was built in the U.S. and operated primarily by Americans. This law doesn’t single out Puerto Rico — it applies to all U.S. ports, the only exception being the U.S. Virgin Islands. Why was the Jones Act waived for Hurricane Harvey and Irma, and did it help? Waivers for the Jones Act have been issued in the past, such as during Superstorm Sandy in 2012, which went largely unnoticed by the public. And waivers were issued recently during Hurricane Harvey and Irma. Hurricane Harvey took a toll on the oil supply system of the Texas Gulf coast. Because Texas is a hub for nationwide petroleum distribution, the damage from Harvey led to limited fuel supplies, adding stress to recovery and evacuation efforts in Texas and possibly Florida. In light of this, Trump issued a temporary Jones Act waiver that allowed foreign vessels to transport petroleum products between the Gulf coast and eastern seaboard. Puerto Rico was also included in that waiver, the Associated Press reported, but it expired before Maria made landfall. On the day the waiver was set to expire, gCaptain, a website for maritime professionals, reported that “no foreign tankers were booked” through the waiver. However, Department of Homeland Security’s David Lapan later said in an email to NewsHour that to the best of their knowledge, eight vessels reported that they made use of the Jones Act waiver for both Harvey and Irma combined. It’s hard to tell yet if that number is accurate. What will Jones Act waiver mean for the delivery of goods to people in Puerto Rico? Even as vessels arrive, though, the island faces additional challenges in getting the goods on shore. 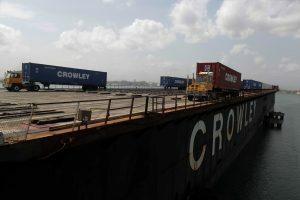 U.S. shipping company Crowley, whose vessels already comply with Jones Act regulations and regularly deliver cargo to Puerto Rico, reported that they deployed additional vessels to hasten the delivery of goods. They also dispatched 50 relief trucks to deliver supplies around the island, because on-island distribution is at the heart of the supply shortage. CNN reported that goods entering Puerto Rico are piling up at the ports, and the island’s damaged infrastructure is to blame. Fuel shortages, damaged roads and debris are preventing truckers from showing up to work, so ships carrying supplies are waiting to enter the port of San Juan, and more are on standby in the U.S. These ships are waiting to deliver goods to people in need. Yennifer Alvarez, spokeswoman for Puerto Rico’s governor, said as many as 9,500 containers of supplies are sitting at the port of San Juan. The Maritime Labor Allowance said in a statement that, “there are currently 15 U.S.-flag ships and U.S.-flag oceangoing tug/barge combinations regularly serving Puerto Rico. These vessels alone are now bringing in more supplies than can be distributed ashore,” adding that they support a Jones Act waiver in emergencies where there is a shortage of vessels. 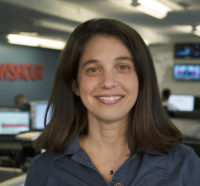 If there becomes a shortage of U.S. flagged vessels, companies can now draw from a larger pool of vessels to help ship goods to Puerto Rico.